INDIANAPOLIS, Indiana (Wednesday, May 18, 2016) – Ryan Hunter-Reay isn’t getting ahead of himself. The Andretti Autosport driver knows it’s only two days into practice for the epic 100th Running of the Indianapolis 500 presented by PennGrade Motor Oil. Some competitors may not have shown all their cards yet, but sitting atop the speed chart today with a lap of 228.202 mph in the No. 28 DHL Honda has the 2014 Indianapolis 500 champion feeling optimistic. Especially after last year, when Hunter-Reay started 16th, ran mid-pack most of the day and finished the race in 15th position. All 33 cars made it onto the 2.5-mile Indianapolis Motor Speedway oval today, making up for a complete rainout Tuesday by completing a total of 2,779 laps – an average of 84 per car. Hunter-Reay clocked his fast circuit early, on the 11th of 94 laps he turned. Much of the late afternoon saw cars running in large packs to get the feel of driving in traffic. Carlos Munoz, Hunter-Reay’s teammate in the No. 26 Andretti Autosport Honda, was second quick on the day at 228.066 mph. 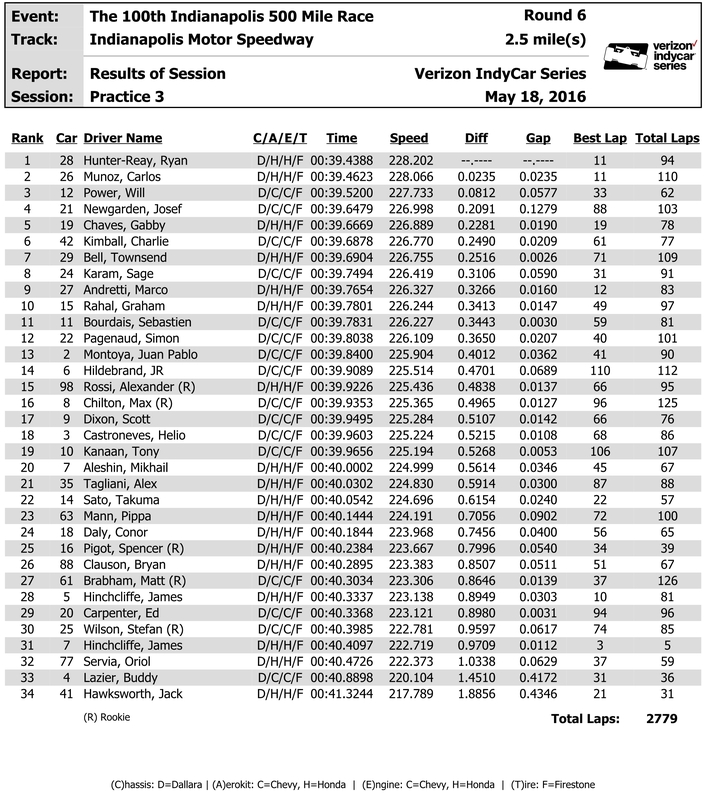 Andretti drivers also set the pace on Monday’s opening day of practice, led by Marco Andretti at 228.978 mph. Will Power; third fastest today in the No. 12 Verizon Team Penske Chevrolet (227.733 mph), didn’t give the lap much credence since like most of the fast ones turned, it came with an aerodynamic tow from cars in front. The lone incident of the day occurred when rookie Spencer Pigot lost control of his No. 16 RLL/Mi-Jack/Manitowac Honda and spun into the Turn 1 SAFER Barrier. The Rahal Letterman Lanigan Racing driver was uninjured but his car sustained significant left-side damage. Qualifying airs Saturday on ESPN3 (11am-3pm ET) & ABC (4-6pm ET) & Sunday on ESPN3 (2-4pm ET) & ABC (4-6 pm ET). Coverage of the 100th Running of the Indianapolis 500 begins at 11am ET May 29 on ABC and the Advance Auto Parts IndyCar Radio Network. Tickets are now available for the Verizon IndyCar Series’ return to Watkins Glen International. The IndyCar Grand Prix at The Glen will take place Sept. 1-4 on the iconic 3.4-mile permanent road course in Watkins Glen, N.Y. — To order tickets, call (866) 461-7223 or click here. INDIANAPOLIS, Indiana – Coinciding with this years 100th running of the Indianapolis 500, Pennzoil has celebrated Team Penske’s 50th anniversary of racing history with the opening of the “Team Penske 50th Anniversary Exhibit” at the Indianapolis Motor Speedway Hall of Fame Museum. It is the largest single team exhibit at the Indianapolis Motor Speedway Hall of Fame Museum. The museum display opened on February 19th, marking the 100-day countdown to the 100th running of the Indianapolis 500, taking place Sunday, May 29th. “We are thrilled to be part of such a historic milestone for Roger Penske and all of Team Penske. It’s humbling for Pennzoil to witness winning traditions half a century in the making,” said Rusty Barron, Vice President of Marketing, Shell Lubricants Americas. The Team Penske Exhibit will put a spotlight on 50 years of racing history, tradition and heritage with an amazing 22-car collection at the Indianapolis Motor Speedway Hall of Fame Museum. The exhibit will feature an extensive lineup of Indy cars, stock cars, Formula 1 and sports cars accompanied by an array of memorabilia and trophies. The collection of Indianapolis 500 winning cars starts with Mark Donohue’s 1972 car along with winning cars from legends such as Rick Mears, Bobby Unser, Danny Sullivan, Al Unser, Emerson Fittipaldi, Al Unser Jr., Helio Castroneves, Gil de Ferran and Sam Hornish Jr.
Also on display for the first time under one roof will be both the 2015 Indianapolis 500 and the 2015 Daytona 500 winning cars of Pennzoil drivers Juan Pablo Montoya and Joey Logano. The Team Penske Exhibit will run from Feb. 19 to Nov. 30, 2016, giving all racing fans the opportunity to witness the winning collection in all of its glory for most of 2016. To top off the celebration, former Team Penske driver Rick Mears was on hand to help Helio Castroneves unveil his paint scheme for the 100th running of the Indy 500. The No. 3 Chevrolet will be sporting the iconic Pennzoil Yellow Submarine paint scheme, the very scheme that Rick Mears so memorably drove to victory at the Indy 500 in 1984 and again in 1988. “We’re confident that the Team Penske winning tradition will continue in 2016 and we’re hoping to be celebrating another victory from the Pennzoil Yellow Submarine 100 days from now,” added Barron. The technical partnership with Team Penske provides Pennzoil with the ability to test existing and new motor oil technology developed by the industry leading Shell and Pennzoil scientists to gain insights from the track that translate directly into the formulation of its consumer motor oils. For more details on Pennzoil and Team Penske relationship, visit www.Pennzoil.com. To stay up-to-date on the latest activities, ‘Like’ the official Pennzoil Facebook Page (www.facebook.com/Pennzoil) and followus on Twitter (www.twitter.com/Pennzoil) and Instagram (www.instagram.com/Pennzoil). INDIANAPOLIS, Indiana – The most iconic celebration in sports will add a new chapter to its legacy this year, as 100,000 fans will have the chance to share the world’s largest milk toast with the winner of the 100th Running of the Indianapolis 500 presented by PennGrade Motor Oil. The Indianapolis Motor Speedway is teaming up with the American Dairy Association (ADA) and Prairie Farms to add this spectacular moment to Race Day. On Race Day, 100,000 16 oz. pints of Prairie Farms milk will be distributed by ADA volunteers to spectators sitting in the grandstand sections along the front stretch. The milk bottles will be available throughout the race at several strategic locations which will be announced before the event. The pints of milk will be specially branded for the 100th Running and will be available at retailers leading up to the race. Fans are encouraged to buy ahead of time to ensure they can celebrate with the winner. A 50-cents-off coupon is included in the Indy 500 ticket mailing. Fans watching from home are encouraged to purchase and participate as well. IMS video boards and PA equipment will be used to help notify attendees of the time to raise their bottle of milk alongside the 100th Running champion. Get ready for a photo moment not to be missed! The tradition of drinking milk following an Indy 500 victory began in 1936 with three-time champion Louis Meyer. Meyer regularly drank buttermilk to refresh himself on a hot day and happened to drink some in Victory Lane as a matter of habit after winning the 1936 race. An executive with what was then the Milk Foundation was so elated when he saw the moment captured in a photograph in the sports section of his newspaper the following morning that he vowed to make sure it would be repeated in coming years. Online: Visit www.ims.com/tickets – Tickets are available 24 hours per day, seven days per week. INDIANAPOLIS, Indiana – Wednesday, May 18, 2016 — Indianapolis Motor Speedway fans are greatly encouraged to arrive earlier than in previous years for the 100th Running of the Indianapolis 500 presented by PennGrade Motor Oil. A whole morning of thrills and entertainment is planned for ticket holders looking to beat traffic and avoid longer lines by coming early. Gates at Indianapolis Motor Speedway open 6am following traditional cannon blast. Fans are encouraged to arrive by 8am or at least two hours earlier than their normal arrival time. This year’s fan Midway features several exciting attractions, including the IMS Kids Zone and interactive activations from PlayStation, Mattel, New Era, Coca-Cola and more. The action-packed Chevy Stage is also in the lot adjacent to the Midway. 100th Running attire will go fast, so don’t miss out! Grab breakfast and then shop for family and friends while supplies last. Retail and food options are available at 6am. Prairie Farms and the Indiana chapter of the American Dairy Association will distribute 100,000 milk bottles to fans on Race Day for an epic Milk Toast with the winner of the 100th Running. Don’t miss your chance to be a part of history! Be first in line to grab a milk bottle. ESPN’s SportsCenter will broadcast four live episodes from IMS this Month of May, with two being taped on Race Morning. The first episode tapes from 8 – 9 a.m. and you’ll want to be in the Plaza early for a prime spot, behind the set and on-camera! If you want your friends and family to see you on national TV, this is the place to be. The Borg-Warner Trophy will begin an epic March to the Yard of Bricks at 8 a.m. from the basement doors of the IMS Museum. Line up outside the museum for a chance to see the Trophy – escorted by The Gordon Pipers – begin its journey. This year, for the first time in recent memory, a rolling stage with musical entertainment will begin circling the track at 10 a.m. New York a cappella group Naturally 7 will play in Turns 1, 2 and 4. This year’s pre-race will feature two fantastic flyovers, military tributes, “Back Home Again in Indiana” sung by Josh Kaufman and the Indianapolis Children’s Choir, the national Anthem from Darius Rucker and Mario Andretti and Keith Urban teaming up for the “Fastest Seat in Sports” ride. Don’t be waiting in line when pre-race starts. A part failure threw Hinch’s car into the outside wall at 126G’s, the largest impact recorded in IndyCar history. Indianapolis, IN (May 18, 2016) – Conor Daly and Dale Coyne Racing are teaming up with Indianapolis Colts star player Pat McAfee for this year’s 100th Running of the Indianapolis 500. McAfee’s company ShirtsForAmerica.com joining as primary sponsor on the American-themed #18 car driven by Daly. McAfee’s recently launched ShirtsForAmerica.com company was born from two ideas. One, to help an Indiana driver at this year’s Indy 500 and the other, to help two military foundations. For each t-shirt sold, a portion of the proceeds will go to Wish For Our Heroes, which was founded by American veterans to help struggling veterans with every day situations they face off the battlefield and to The Pat McAfee Foundation. Now in its fourth year, the Pat McAfee Foundation has given more than $150 000 in scholarships to children of military families. “Conor and I have been friends for a while now and I couldn’t wait to hear his thoughts about the 100th running of The Greatest Spectacle in Racing and how magical the Indy 500 is,” shared McAfee who is also a stand-up comedian. “Conor, being a kid from Indiana, started talking about how fantastic it is for Indiana that all of these awesome things are going to happen, how the entire world’s eyes turn to Indiana, and how every year we knock it out of the park. While we chatted about how lucky we were to be Hoosiers, he told me that he didn’t have a primary sponsor yet for the race. I didn’t believe him at first but then I saw it as an opportunity not only to help an Indianapolis kid run in the 100th Running of the Indianapolis 500, but also, as a chance to raise money for a couple of military foundations. So I created ShirtsForAmerica.com and sponsored his car. When we’re chugging milk in Victory Lane Memorial Day weekend, we’ll do it with some true fulfillment knowing that we’re also helping American heroes. The #18 car has shed its white, green and black livery for the red, white and blue. The American flag will be featured on the nose as well as on the shark fin, with the ShirtsForAmerica.com logo placed prominently on the side pods. The all-American #18 ShirtsForAmerica.com machine will make its first public appearance on Thursday, May 19 during the Noon to 6pm practice session. Qualifying for the Indianapolis 500 takes place this weekend, May 21st and 22nd with the Greatest Spectacle in Racing going green on May 29th. The race will be broadcast live on ABC starting at 11am ET.